We also like to throw in some blackberries to add a little tartness to the pie and glaze. Combine the first four ingredients (the cream cheese, 1/4 cup sugar, l/4 cup sour cream, 1/2 tsp. vanilla extract). Beat at medium speed of an electric mixer 1 minute or until smooth. Spread mixture in baked pastry shell; cover and chill for 1 hour. Place 1 cup blueberries in a small saucepan; mash with a potato masher. Add water; bring to a boil. Reduce heat, and simmer 3 minutes. If necessary, add water to juice to make 1 cup; return to saucepan. Combine 1/2 cup sugar and cornstarch; stir into berry liquid. Bring to a boil, and boil 1 minute, stirring constantly. Stir in lemon juice, cool. 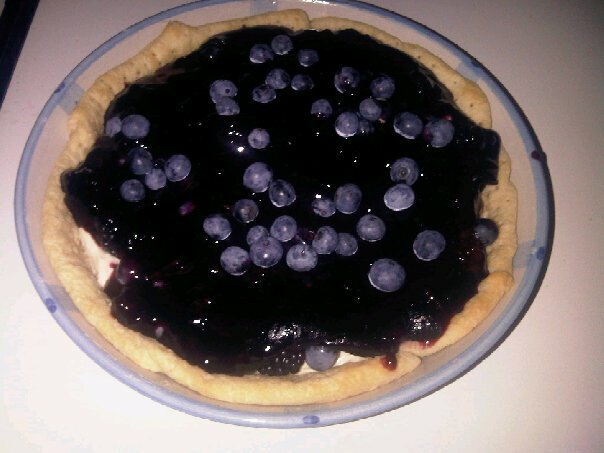 Place 1 1/2 cups blueberries over cream cheese mixture; pour glaze over top. To serve, dollop each slice with sour cream. Combine powdered sugar and cinnamon; sprinkle mixture over sour cream. Garnish with blueberries and freshly grated nutmeg.